Virtual worlds aimed at kids have exploded since the success of Club Penguin. DreamWorks is getting in on the action with Kung Fu Panda World, an aptly named free to play browser MMO based on the movie. The game has a distinct art style and high production value. The character creation and tutorial process is accompanied by great voice acting, and there are plenty of appearance customization options. While there is a persistent world to wander around in, the main draw in Kung Fu Panda World is its mini-games. These come in three types, each marked with a different symbol. Travel between regions is instant using the map screen, but it is possible to manually walk from one area to another like in PetPet Park. Speed – Reflexive games that require quick movements. How long can you last? Cleverness – Puzzle like games that challenge your mind. +Play minigames solo or with other players. -Many features require premium membership. -Limited graphic options, simple visuals. 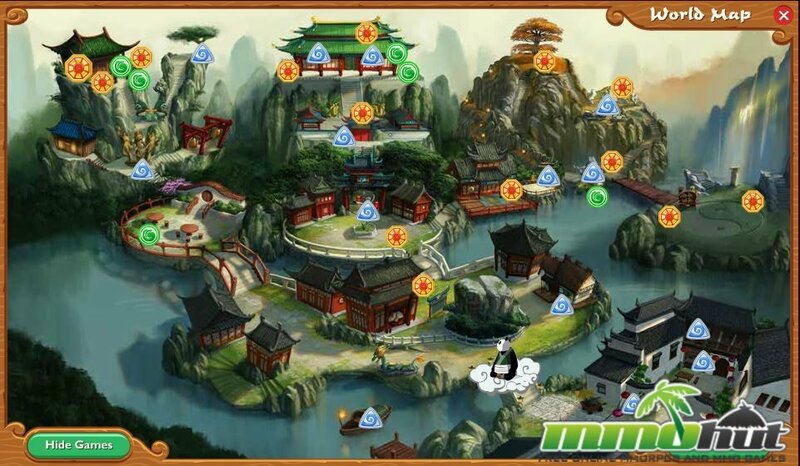 Description: Kung Fu Panda World is a 2D browser based virtual world based of the Kung Fu Panda movie. Aimed primarily at kids, the game has heavy chat controls and dozens of mini-games to enjoy. Aeria Games, a leading global publisher of free-to-play online games, has released the full website for F.E.A.R. Online.